Dow Packaging and Specialty Plastics, a business unit of The Dow Chemical Company, has won the 2014 China Sustainable Package Technology Award for its PacXpert Packaging Technology. 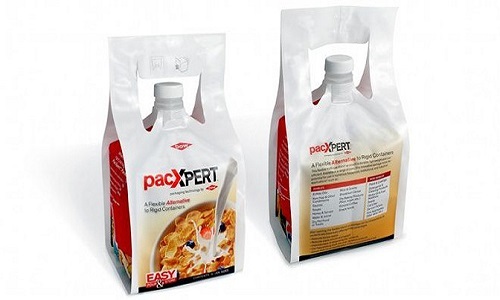 Dow’s PacXpert allows users of traditional rigid containers changing to flexible packaging. Even as a flexible packaging, the cube-shaped package is shelf stable and can stand equally well upright or on its side. Comparatively, the stand-up pouch produced utilizing this technology has greater flexibility and sustainability, the company said. PacXpert Packaging Technology offers a choice of fitment options for dispensing and re-closing, plus integrated ergonomic dual handles for precision pouring, easy reclosing and carrying convenience. Broad billboard space is provided for more graphic design options with four printable sides and see-through windows. Available 1-20L in sizes, the package is suitable for household, institutional and industrial applications. Compared with rigid containers, PacXpert not only requires less raw materials to produce and offers a higher product-to-package ratio, empty packages can be shipped flat to increase transportation efficiency, which reduces CO2 emissions and decrease waste removal costs. “We are honored to receive this award in Asia Pacific for our PacXpert Packaging Technology. This recognition serves as a testament to Dow’s ongoing contribution and commitment to sustainability and innovation,” commented Kiattipong Techavachara, New Business Development Director for Asia Pacific and Value Chain Leader for Southeast Asia, Dow Packaging and Specialty Plastics, Asia Pacific. PacXpert Packaging Technology is licensed globally by Dow through an exclusive agreement with Smart Bottle Inc. It has previously been awarded two prizes: The ABRE Gold Award from the Brazilian Packaging Association in 2013 and The WorldStar Packaging Award from the World Packaging Organization in 2013/2014. In its 5th addition, the China Sustainable Package Technology Awards was organized by the Packaging Managers Club and was presented at the 5th China Package Technology Innovation and Sustainable Development Forum on October 16 in Xiamen, China.